I can remember that first little pizza shop sitting on a dead end street in the bottom of a nearly-dilapidated, centuries-old building perched right on the side of a narrow canal. It was our hidden gem that no other tourist could seem to find. The only other people there were a few locals chatting away in a beautiful language I knew little of. As gondolas float by and the murmur of excited vacationers fill the distant air my brother and I settle right next to the chef and the only man working at the small pizzeria. 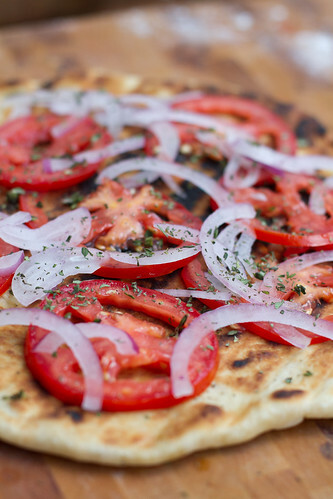 We gorge on one pizza after the other trying our favorites and those flavors we could never have even imagined. For my brother and I, this was pure heaven. We spent the rest of our trip in Italy hopping from one pizzeria to the next. Whether we were in Venice, or Florence, Rome or the Tuscan country side, pizza was in our greedy, hungry hands constantly. Ever since that trip I have dedicated myself to creating the perfect pizza, worthy of a place next to the large, thin discs lining the pizzeria shops and my heart. Yes, I have had delicious pizza in New York, Chicago and San Francisco even but none seem to achieve the simple perfection of an Italian pizza. None seem to cherish the roots of the pizza itself, a thin vessel of bread meant to highlight a combination of delicious, fresh toppings. Over the years and from one location to another, each place has adopted their own variation. I can’t fault anyone for choosing one way over another but I can look on with a hesitant eye as people stick a fork into a two inch tall “pizza” that is little more than a savory pie of unnecessary proportions typical of american gluttony. This got me thinking though. I decided to put my narrow-minded pursuit of the perfect pizza aside for a moment and try something new. I decided to grill pizza. Being a Texas boy, I figured if Texas were to refine and hone it’s own pizza style, surely it would be done on the grill. What came of this tangent is my new favorite way to cook pizza. I have fallen in love with this thin, marvelous dish all over again. Here I’ve shared two simple, three ingredient pizzas (minus the ingredients for the crust). Both pizzas are sauceless and only one pizza requires cooking the ingredients ahead of time. When grilling pizza you’ll want to make sure and get your grill as hot as possible, then lower the heat on the side you’ll be cooking the pizzas (if using charcoals I suggest moving the hot coals to one side or around the outside and if you’re using propane I suggest leaving one side on high and the side you’ll cook on, on low). If you cook over direct, high heat the pizza dough will brown quickly and it can burn easily. Cooking over low or indirect heat will give you a little more time as it is a more forgiving cooking temperature. Also, be sure to prepare the dough well in advance as it could require up to two hours to rise. 1. Roll out the dough and oil one side liberally with olive oil. Place the oiled side down on the grill grates. Cook 5 to 10 minutes with the lid closed until the bottom is golden brown. 2. Oil the top of the dough liberally and flip the dough over. 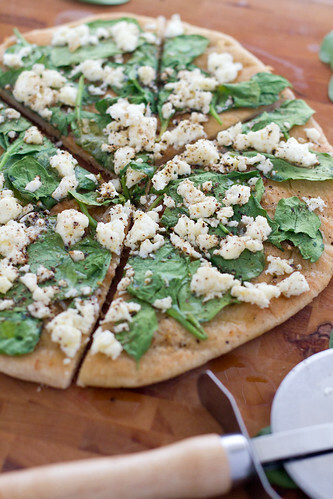 Add more olive oil then stack the spinach, feta cheese and shallots on top. Cook for 5 to 10 minutes with the grill closed until the bottom is golden brown and the cheese is beginning to brown. 3. Lightly drizzle olive oil over the top and serve immediately. 1. Wrap the fennel slices in foil and place on the grill. 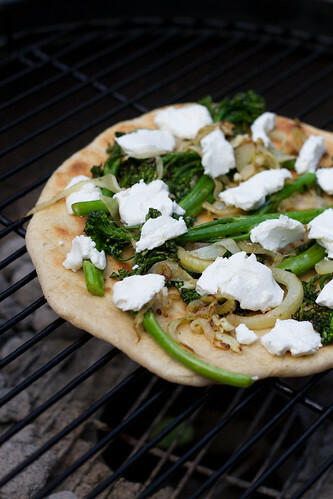 Place the broccolini whole on the grill as well and cook both 10 to 15 minutes or until cooked but still crispy/crunchy. 2. Roll out the dough and oil one side liberally with olive oil. Place the oiled side down on the grill grates. Cook 5 to 10 minutes with the lid closed until the bottom is golden brown. 3. Oil the top of the dough liberally and flip the dough over. Add more olive oil then stack the ingredients placing the cheese on top. Grind pepper over the pizza and cook for 5 to 10 minutes with the grill closed until the bottom is golden brown and the cheese begins to melt. 1. Dissolve the yeast and sugar in the warm water. Add the olive oil and mix in well. 2. Add the flour and salt and mix until a dough forms. Knead the dough for 7 to 10 minutes. The dough should be elastic and resist tearing or springing back quickly. 3. Place the dough in an oiled bowl, cover and let rise in a warm location for 1 to 2 hours until the dough has doubled in volume. 4. Once doubled in volume, press down the dough lightly and divide into two even chunks. Let the two dough balls rest 10 minutes covered. 5. 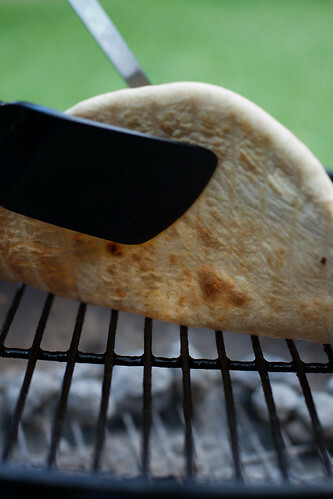 Roll out each piece of dough on a lightly floured surface to make a 10 inch circle just before putting it on the grill. The best part of pizza like this is how easy it is to change them up. Use whatever you’ve got in your kitchen or in your herb and vegetable garden to create a pizza custom tailored just for your liking. Enjoy! Once again, huge thanks to Russell for his guest post and recipe – incredible stuff from a wonderful person! Go and subscribe to Chasing Delicious and follow Russell on Twitter – he’s wonderful! Be still my heart! This looks like one mighty delicious pizza! Great guest post! These pizzas sound so fabulous. 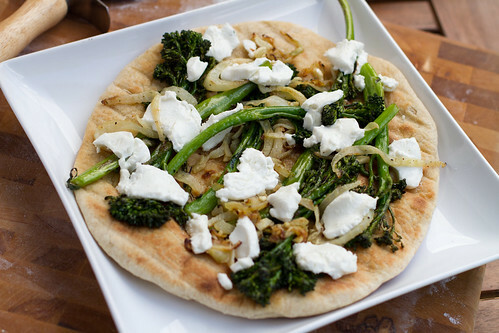 I love the broccolini and fennel with the goat cheese. YUMMY. Brilliant guest post! Absolutely love pizza, but never have them grilled. 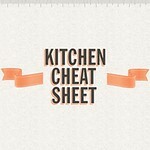 I’m gonna be making pizza today and I’ll be using Russell’s pizza dough recipe. What a great guest post! I love pizza too, and I’m always sucker for good writing and great photographs. Thank you for sharing another delicious eat. I’m hungry and smiling now. I hope you both are having a lovely start to your weekend. Relax and enjoy! Much love from Austin. Great guest post. Pizza without too much fussing with the ingredients . AWESOME ! !